“Upwards of seven thousand people took part in the annual Eucharistic Procession through the streets of Galway on Sunday, when one of the greatest demonstrations of faith in recent years was seen. Practically all of that part of the city’s population which did not take part, thronged the footpaths, and when the procession arrived at Eyre Square at six o’clock, upwards of ten thousand people knelt on the green sward in front of the specially constructed high altar for the final Benediction, which was imparted by his Lordship, Most Rev Dr Browne. “The route of the procession was a blaze of colour. Set in the doorways along the main street were beautiful miniature altars erected in honour of the Sacred Heart. Many of the house fronts were hidden behind shrubs and masses of flowers, and in the windows were numerous pictures of The Sacred Heart, the Blessed Virgin, St Joseph and St Patrick. Overhead bunting and religious scrolls spanned the streets. “The various sodalities and sections which took part met in the grounds of St Mary’s Diocesan College at New Line where Benediction was imparted by the bishop at 4.30pm and then the procession left the college and proceeded via New Line, Henry St, Mainguard St, Shop St, and William St to Eyre Square. The Monstrance containing the Sacred Host was borne under a rich canopy of gold by Most Rev Dr Browne. Members of the Society of St Vincent de Paul had the privilege of carrying the canopy. A fascinating report there from the Connacht Sentinel of June 13, 1939. In addition to those already mentioned, some of the other groups taking part would have been clergy from all religious orders, the professional staff and student body from UCG, nurses from the Central Hospital, the Sea Scouts, The Legion of Mary, Youth Confraternity, the CYMS, Amalgamated Woodworkers, Red Cross, Order of Malta, and the FCA. Occasionally, some bands would participate and various choirs would sing hymns and the sacred music. 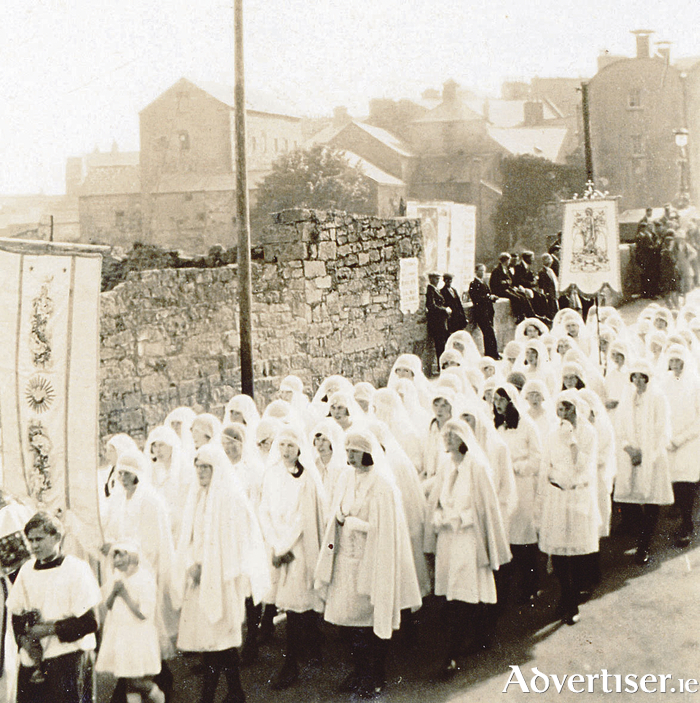 Our photograph, which dates from the 1930s, shows a Legion of Mary group with some interesting banners, crossing O’Brien’s Bridge on their way to the Square, obviously delighted to be a part of one of the biggest religious festivals of the year.